Ah...holidays! 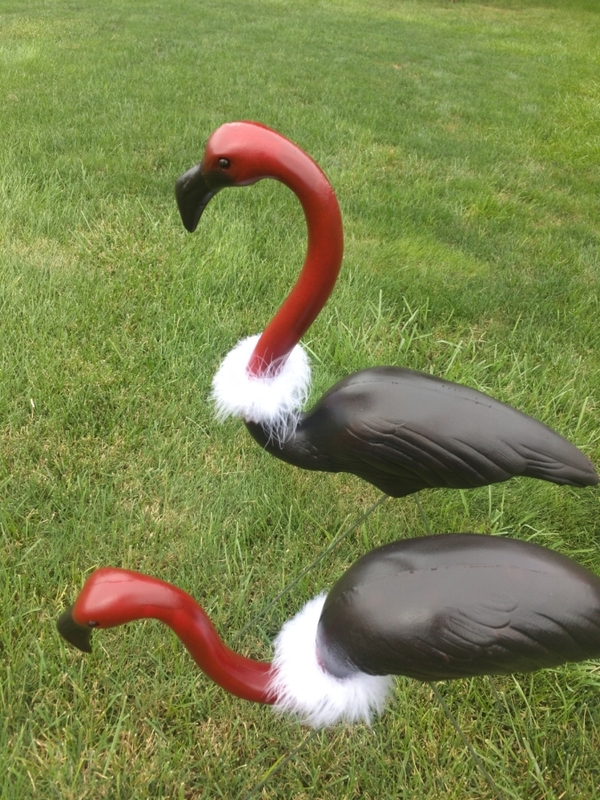 The period between Halloween and Christmas is the time of year when we humans really like to amp up our outdoor decorating, because who doesn’t want a plastic vulture in their yard? (Short answer: my mom.) Whatever your personal tastes may be, holiday decorations are serious business, but they can have some serious consequences for wildlife, too. Lucky for us there are ways to decorate that won't disturb the other creatures that share our space! On Halloween, especially, we like decorate with owls, crows, rats, and vultures (all the best animals, clearly! ), but we also need to be mindful of the REAL wildlife, too. You might be asking yourself, "how in the world could my seasonal flair hurt animals?" Wildlife can suffer greatly from becoming entangled or ingesting man-made items such as netting, webbing, strings, and balloons. The popular sticky fake spider webs are one culprit as animals that normally fly through that area or feed on the vegetation that it’s covering, can become entangled and will not be able to free themselves (and I think we've all enjoyed the experience of unexpectedly walking into a spider web, so you can see how an owl or a songbird could fly right into one, too). Wildlife rehabilitators treat animals each year that are harmed from becoming entangled. The dove below was found with ribbon around its wing (likely matching someone's wedding colors!). While this dove was fortunate to be found early, these situations can have disastrous consequences. Animals who become entangled can quickly become stressed, dehydrated, and emaciated without access to their usual resources and are also unable to escape predatators. Other physical injuries also occur, including broken wings and lacerations, that often result from being caught in nets, webbing, or fishing line. For some tips on what to do if you have found an entangled animal, visit here, and, as always, reach out to a wildlife rehabilitator in your area for advice! Don’t use fake spider webs or other decorations made of entangling fibers on the outside of your home. Wild animals can easily get trapped and may not be able to break the material to free themselves. Avoid decorations with loops or closed circles. A foraging animal can inadvertently put its head through a loop or circle and choke itself. Avoid decorations with small, dangling, edible-looking parts. Strings of lights can become snare traps for adult male deer who get them caught in their antlers. Avoid hanging lights or decorations in areas where deer pass. Candy, and the plastic it’s wrapped in, can also be a hazard for animals. Don’t leave candy out where wildlife may find it, and dispose of all candy wrappers properly. Carved pumpkins may be attractive to wildlife as food, so properly dispose of them if you don’t want post-holiday trick-or-treaters. Be alert for nocturnal wildlife while trick-or-treating. Avoid cutting across lawns and through brushy areas to avoid accidental encounters with your wild neighbors. Drivers on Halloween night know to be on the alert for children, but we encourage you to also be aware of wildlife that may be scared out of hiding by all the unusual nighttime activity. We at WRSPA wish everyone a Happy and Safe Halloween (for humans and animals!) As always, consider donating to Help Us Help Wildlife. Your contribution goes directly to assisting wildlife rehabilitators in Pennsylvania!